Visas explained step by step from the experience Andy Graham a Perpetual Traveler for over 18 years and 107 countries. I applied for Ghana Visa in Cote D'ivoire - Ivory Coast, in morning and received next day after 3. Costing 30,000 cfa. I received a 7 day visa on arrival for 15,000 CFA, or 30 USD at the Aflao, Ghana / Lome, Togo Border, then changed to a 1 year at Togo, Passport Service. There are easy to enter countries, where you just arrive at the border. Maybe a bill will pass that will allow investors starting a business in the USA to stay easier in 2013, Obama is helping the bill to pass. 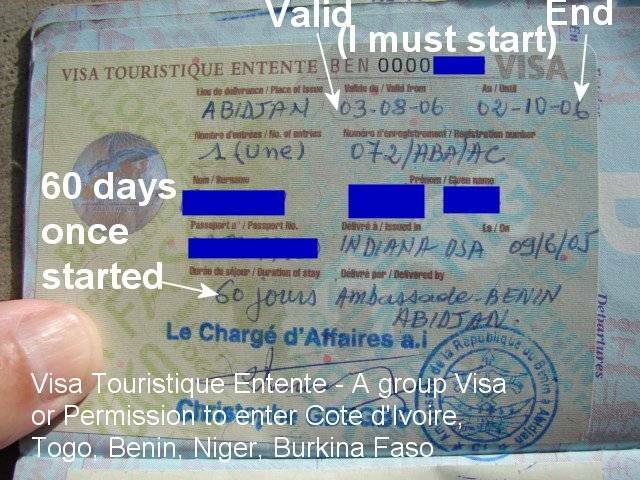 I applied for a Togo Visa in Abidjan, Cote d'Ivoire - Ivory Coast in October 2010 and received the Visa. Easier than you think... I have entered 88 countries, and got Visas dozens of times, not sure, hard to count. Note: Many Land Borders will grant you a Visa at the Border, and sometimes worth the trip. - You need to be a good citizen, well dressed, nice, polite and patient, you must be the type of person who should be invited to another country. Hotel Reservation - Difficult to do, maybe make up an e-mail address and send youself the reservation. Black Pen to fill out applications or Blue Pen - You need both. Letter from the Embassy of the USA - Note, the USA does not give this letter - Get any kind of letter. Money in US Dollars, regardless of the country you are presently located and enough money in local currency to pay. You need both currencies. Theree is a date by which you must enter, and that is when the date starts. Multi-Entrance visas are sometimes not respected and you must pay again. A visa is an indication that a person is authorized to enter the country which "issued" the visa, subject to permission of an immigration official at the time of actual entry. The authorization may be a document, but more commonly it is a stamp endorsed in the applicant's passport. Some countries do not require a visa in some situations, such as a result of reciprocal treaty arrangements. The country issuing the visa typically attaches various conditions to the visa, such as the time that the visa is valid, the period that the person may stay in the country, whether the visa is valid for more than one visit, etc. Many countries require possession of a valid passport and visa as a condition of entry for foreigners, though there exist exemptions (see below). A visa does not generally give a non-citizen any rights, including a right to enter a country or to remain there. The possession of a visa is not in itself a guarantee of entry into the country that issued it, and a visa can be revoked at any time. The visa process merely enables the host country to verify the identity of the visa applicant before the entry of the applicant. Special permits may also be required, such as a residency permit or work permit. A visitor may also be required to undergo and pass security and/or health checks upon arrival at the border. Visas are associated with the request for permission to enter (or exit) a country, and are thus, for some countries, distinct from actual formal permission for an alien to enter and remain in the country. Some countries require that their citizens, and sometimes foreign travelers, obtain an exit visa in order to be allowed to leave the country.